Life doesn't ever seem to want to slow down around here... I can't believe the week is almost over. It seems like there is still so much to do! The weather has been really odd, so I've felt a little thrown out of my groove. Hopefully the sunshine will be back to stay soon! Well... 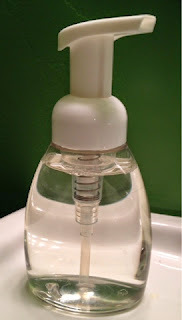 I've got some posts coming up in the next week or so, on simple and inexpensive ways to help make our homes toxin-free. Today, we're going to make our own liquid hand soap! It's so very fast to mix up and costs just cents to make. You may ask, why should I care if my home is toxin-free? In the detox challenge I issued a few months ago, I mentioned the affect toxins have on our hormones, which can lead to an inability to lose weight (or gain weight in some cases), infertility, developing diseases, etc. Hopefully these are good enough reasons for you to at least consider cleaning out and switching out some of the most often used toxic products in your home. :) After all, my goal is to help us all find ways to optimize who we are so we can live (not just survive) and rock our personal missions! In transitioning out the toxic products at home, I get that it can be overwhelming and sometimes time-consuming. There's plenty of research that can be done to find good products or figure out how to make your own. Then there's the issue of having everything you need to make it. So what I'm going to suggest is, don't stress. Take it one product at a time (within your budget of course) and before you know it, your family will be healthier and happier! 1. Fill soap dispenser with 1-3 tablespoons of liquid castile soap, depending on the size of dispenser. 2. Fill the remaining space in the soap dispenser with distilled or filtered water. Shake gently. That's it! So easy, right? How about that for a 15-minute win? Have you found this technique helpful this week? It's a great tool for me to just get started with something I don't want to do. Especially projects that will take longer than 15 minutes. If I can get myself to commit to giving it 15 minutes of effort, I'll usually keep going and get the task done. I just needed a little jump start!